This stuffed pasta dish is absolutely delicious, and we've made it truly easy to prepare. Spread 3/4 cup sauce onto bottom of 13x9-inch baking dish. Mix egg, cheeses and pesto until well blended; spoon into resealable plastic bag. Use scissors to cut small corner from bottom of bag. Fill manicotti shells by squeezing cheese mixture into both sides of each shell; place in baking dish. Top with remaining sauce; cover. Bake 40 min. or until heated through. 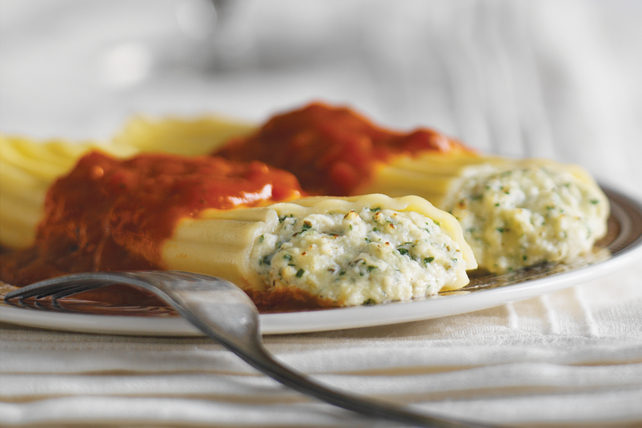 If you prefer a more traditional-style manicotti, simply omit the pesto. Manicotti shells can be cooked ahead of time. Cook and drain shells, then place in tray sprayed with cooking spray; cover with plastic wrap. Refrigerate up to 24 hours before filling and baking as directed. Sprinkle lightly with additional Parmesan just before serving.